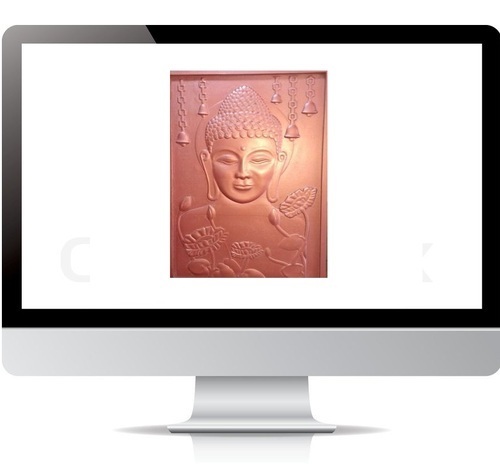 We are offering Budha 3D ArtCAM Design File to our clients. ArtCAM Pro is an artistic 3D CAD/CAM package with the functionality to do 2D design, editing and layout tools, vectorization of bitmaps, true shape nesting, 3D modelling tools, 3D model import, interactive sculpting, texturing tools and ability to re-use 3D models as clipart in any size in other designs. Machining options include, automatic inlay tools, fully customizable tool database, V-carving, prismatic carving, drilling, profiling and the ability to add tabs onto a toolpath to stop the part moving as it is cut out, plus 3D machining, the ability to limit the area a tool cuts in 3D, multi-tool smart engraving, feature machining and many other options. Includes ArtCAM post processor and 3 days of training, one to one at our training facility. Beautiful wall art can be created using this file on a CNC router. "RPM Tools Consulting", provide products and services to acquire and run systems that allow users to create physical objects from computer models. Not only can these technologies be used to create prototypes for later production in the medical, industrial, artistic, wood working, signage, architectural, jewelery and other fields, they can also be used to make finished parts or tools. CNC Router, CNC Mill, CNC Lathe, Cutting Tools Laser Engraving/ Marking / Cutting, Plasma, Water Jet Cutting Machines, RP Machines, 3D Scanner, CAD / CAM Softwares, Plastic Cutting Machine, Stone CNC Router, Glass CNC Router, CNC Trainer Machine, Engraving Laser Machine, Laser Engraving Equipment, CNC Tools, CNC Engraving Machine, CNC Engraving Tool, CNC Machine, CNC Tool, Engraving Tool, Engraving Machine, Carving Tools, CNC Router Bits are supplied and for your success using these machines. The best support in applications and service are provided at every stage. Excellent training on designing and machining by experienced engineers is given with every machine. RPMTC help organizations to acquire the right technologies and to run the unit to extract maximum benefits. RPMTC source the right machinery and software systems to exactly fit to market / customer needs. RPMTC also do Build, Own / Transfer and Operate Rapid Prototyping and Manufacturing Systems. RPMTC support single machine to master turnkey projects.